Wasa 30 became the next boat in the series and here the designer Leif Ängermark exceeded and designed a boat with less displacement and less wet surface, all in order to create a fast and well-sailing boat. 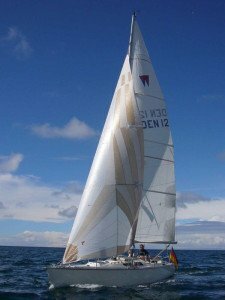 He succeeded in proving the concept when a Wasa 30, in 1980, participated in the magazine “Båtnytt’s” One-of-a-Kind regatta. She was not only the first boat across the line in every leg, she also defended her LYS number and won the competion on adjusted time, a good remark. Both for Wasa 55 and Wasa 30 the number refer to the measured sails surface area in square meters. From 1978 to the mid-80s, 62 Wasa 30:s were built. .